Why Autumn Is Undisputeably The Best Time To Visit South Korea. South Korea Climate - Autumn in South Korea is the medium between a hot summer and cold winter. Autumn is rather short but still quite enjoyable. Autumn is lovely as it is not too hot and not too cold as well, although the winter frost can start as early as October. Autumn here is the time when crops are collected and new ones like barley and wheat are planted. During these warm and dry days, farmers are usually out and about gathering rice for future usage. It is the golden time of the year with sunny mornings and cool nights where it is perfect for wandering into the city streets. 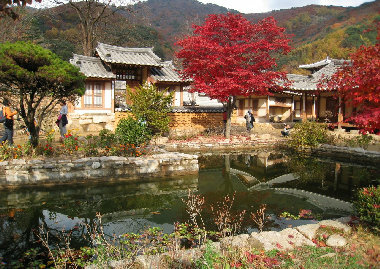 To me, Autumn is the best time for tourists to travel to South Korea! The temperature in autumn is usually a beautiful 25 degrees celsius so it is a fantastic time for visiting tourist attractions and vibrant colorful flowers. As already mentioned, Autumn in South Korea is drier than Summer, thus there is no need to take all those raincoats if you plan your trip in this season. 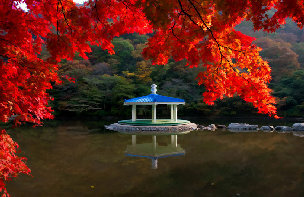 Autumn in South Korea usually lasts for two months, that is October through November. The days in this period are very clear due to the decided shift in the air mass movements brought by the October climate.